Here are two more images that illustrate how different the 1981 Eatons incarnation of the Pacific Centre Mall departmental store was to the newly reclad and reconfigured building that’s there today. On the Howe Street side the building still offers little relief; it’s a box with emergency exit doors at ground level. The entrance ramp to the underground parking cuts into the sidewalk (and the entry ramp up the street crosses it on the corner in a way that traffic engineers would never allow today). On the Granville Street side the design wasn’t significantly more pedestrian friendly; there was a narrow black slot window, and then emergency exits (that had to be retained in the redesign). The entire remaining building face was composed of concrete ‘stone’ panels; windowless except for another black slot under a curved metal façade on the top floor. Further north along Granville the previous inset entrance has been filled in, and there are display windows rather than black glass panels. Our previous post looked at the recent changes to the retail box designed in 1973 by Cesar Pelli at Victor Gruen Associates with McCarter Nairne and Associates as local architects. The 2012 building wasn’t by any means how it looked when it was initially designed, or back in 1981 when these images were shot. Construction work was still underway adding the top floors in a McCarter Nairne design that earned it the nickname of “The Great White Urinal”. (The curved top, which was metal rather than concrete, was, when clean, quite shiny – which didn’t help). The Howe and Robson corner (above), shows the original slot entrance; a more dramatic black and white element. The 1999 reconfiguration opened it up; the contemporary building brightens it even more. The 1999 changes on the Granville and Robson corner were more dramatic – the original design didn’t have any glazing at all; the blank concrete faced the street corner. The 1999 rework opened up the corner a bit, but today’s version is very different. There was a semi-circular drum facing the plaza in front of the TD tower. When the building was completed a soaring sculpture by George Norris was installed. It was removed and donated to City of Surrey in 1988, who waited 8 years before selling it for scrap. The upper four floors of office space have been given an entrance on the Georgia Street plaza, and named as 725 Granville. There was some doubt that the huge floorplates would find tenants – in practice the space was leased before the building work was completed. Lawyers Miller Thomson were the first to sign up, and they were joined by Sony Pictures Imageworks (who moved their entire operation from California to occupy the fifth floor) and Microsoft, who occupy over 140,000 square feet of space on the top two floors. This is the most recent ‘before’ image we’ve posted. We hadn’t even shot it when we started blogging here less than four years (and 500 posts) ago. Despite the relatively short passage of time, the building looks very different. It also evolved quite a bit over the years before our 2012 image, above, as we’ll show in the next few posts. In 2012 Sears were heading into their final closing sale in Downtown. They had moved into the space occupied by Eaton’s when they acquired that company in 1999 after T Eaton & Co filed for bankruptcy in 1997. An initial attempt at re-launching the Eaton’s brand failed, and the long lease that Sears held on the Pacific Centre property saw them rebrand as Sears, although they didn’t fill all the floors. Sears never seemed to be particularly successful, despite having little lower cost competition Downtown, and eventually Cadillac Fairview, the building’s owner, made them an offer to buy back the remaining period of the lease, and started to plan for a new use for the building. (Sears had previously been the retail tenant in the Harbour Centre, where Eaton’s had also previously been located (before Harbour Centre was developed) when they took over the Spencer’s Department store in 1948). When Sears closed there were seven floors of store space and a basement. Cadillac Fairview already had a taker for some of that space: Nordstrom’s the Seattle-based retailer wanted to enter the Vancouver market, and wanted a large floorplate space Downtown – but only three floors. Although Cadillac Fairview had considered demolishing the building, the idea of repurposing the steel frame of the 600,000 square foot structure allowed a much faster build-out. Nordstrom’s occupy nearly half the above grade structure. The basement floor has a new access from the street and is a continuation of the underground mall section of Pacific Centre that was completed in 1973. The top four floors had two light-well spaces pushed into the centre of the building and office space created. The original design was by Cesar Pelli, working at the time for Victor Gruen Associates in Los Angeles (although Gruen had returned to his native Austria when the mall was designed). The local architectural partners were McCarter Nairne and Associates. Pelli’s buildings had simple, dramatic black and white elements. The TD tower (and the slightly later IBM Tower) were clad in very dark brown glass that looked black much of the time. The retail box was clad in white concrete ‘reconstituted stone’ – described a year after completion as showing ‘a predilection for austerity’. It started life at five storeys, but two more were added in the early 1980s. The recent reconfiguration and recladding of the building were designed by James K M Cheng. The building is now much more open and glazed (with 1,700 new panels of glass), with an attempt to break down the bulk of the box and to reflect the design of other Nordstrom stores that frequently feature cream limestone. Over 91 per cent of the previous building has been re-purposed or recycled – over 6.8-million kilograms of material. The concrete panels were taken to Langley Airport to create roughly 6,000 square metres of new roadway. Other concrete went through a crusher and was ground down to gravel and sand. Gypsum was extracted and reused as new stock and wood went into a chipper and was reused as biofuel. This solid-looking structure dates back to 1909, and was designed by Hooper and Watkins for Song Mong Lin Co, (a company owned by Mong Wing, a Chinese housewife). It was altered in 1941, when Townley and Matheson refitted it for the Imperial Bank of Canada; Fred Townley had initially designed alterations for the bank here in 1919. These days the 5-storey structure has 70 SRO rooms, but it started life as an office building known as the Loo Building. Mong Wing was married to a very successful Chinese merchant Loo Gee Wing, so her development of the building was almost certainly at his behest. We’ve written a great deal about Loo Gee Wing elsewhere; as far as we can tell he started his business life in San Francisco, moved on to Victoria (where he was said to be the second wealthiest private landowner after the Hudson Bay Company) and then to Vancouver, where he developed extensive business interests including a number of properties. When it opened, the Loo Building had dozens of companies taking space: it’s not a big building, so they must have each occupied modest offices. As well as a number of real estate companies were the Canadian Freight Association, several physicians including Dr Dyer, the Vancouver Fiber Co, the Beaver Realty Co and W A Cumyow, the city’s most important Chinese interpreter. Up on the third floor were a chiropodist and a Corsetiere, an optician and an osteopath alongside timber agents and land agents. On the fourth were building contractors Hemphill Bros, the Hardman Hat Co and the Vancouver Financial Corp Ltd along with the Union Express, City Express and Diamond Express. Apart from W A Cumyow they appear to be Anglo businesses in a Chinese-owned office building. By 1920 the building had become exclusively residential. It had been acquired by the London, British & North America Co, who hired W J Northcott to make alterations. 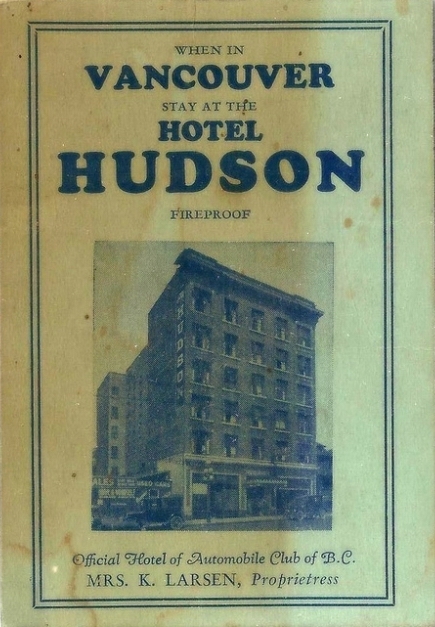 An advertisement in the Daily World announced the change, offering two-room suites, disappearing beds and well furnished modern conveniences for housekeeping; “elevator, respectable, reasonable rates”. It attracted some important people in the city; Basil Pantages, manager of the Pantages theatre lived here; Dr Martin Kroeger, managing director of Vancouver X-Ray Institute lived on the third floor; George S Sellers of the Cedar Cottage Painting Co on the second floor. By 1935, when Wilfred Minto was managing the premises they were known as Abbott Mansions. Just selecting the surnames starting with the first two letters of the alphabet we find James and Harry Almas of the Almas Coal and Refrigerated Fruit Stand lived here; (a unique and unexpected mixture), P J Beaudreault, a carpenter and his wife Deliah, Jake Biket, a waiter and his wife Viola, Alfred Brett, a trucker with the CNR and his wife Kathleen, R J Brooks, an assembler with the Ford Motor Co and Elsie and Mark Butcher – Elsie was a stenographer. Somebody listed as Aug Dandruff lived here too – sadly, we don’t know if they were a hairdresser. F Glen Mitchell lived here with his wife; he was manager of the Piggly Wiggly on Denman Street. 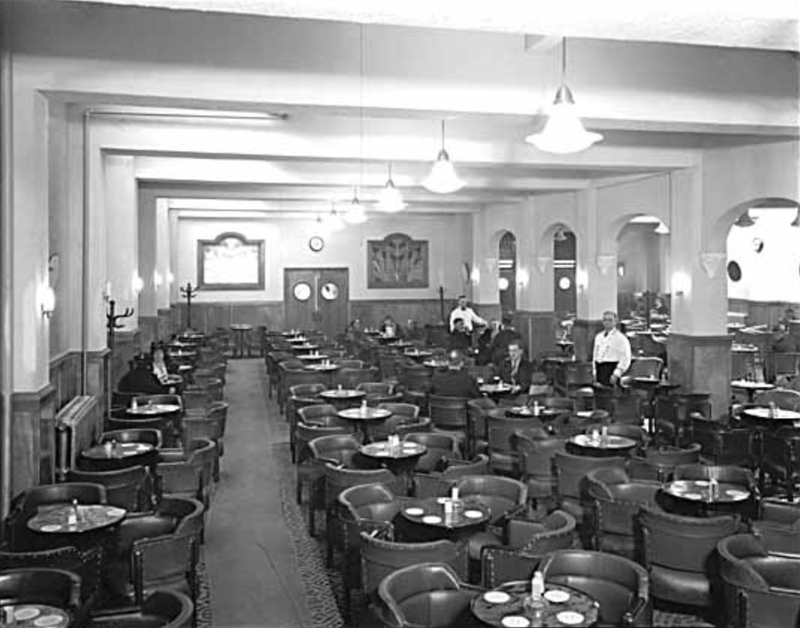 There were two waitresses living here, one from the New Good Eats Cafe, and one from the Cairo Cafe. Dr. Henry Powell had his consulting rooms in the building on Abbott Street. In 1955, the last year we have a street directory for, the Mansions were owned by the Yorkshire Corporation. There were still plenty of working people living here: a glove cutter; Anne Bowes who was cashier at the Pall Mall Café; a fireman; William Cooper, a tailor; a candy packer for Nabob Foods and Magda Curie, a waitress at Eatons. Unlike in earlier years quite a few residents were retired; several of the residents were widows. By the early 90s the residents were poorer; the building more run-down. Many residents had health problems. Now run by the Central City Foundation, it offers 70 rooms to Downtown Eastside residents in one of the better-run SRO buildings. After the Brandon Auto Livery that replaced the First Congregational Church at the corner of Georgia and Richards closed down, there was another building completed in 1938 for the Western Auto Supply Co – with a huge sign on the roof in case you had trouble finding them. Based in Kansas, Western Auto Supply offered Western Giant Tires and Batteries and an array of other products, including ‘Wizard’ brand tools, camping accessories, bicycles and radios – they were a bit like Canadian Tire (who hadn’t expanded this far west in 1938). The Western Giant Silent Grip tire that year was available with either black or white sidewalls – making it “America’s Most Beautiful Tire”. The Manager / Treasurer of the business changed over the years – C E Hiatt was replaced by W C Walton in 1940, and then in 1946 W L Tollefson. In 1947 it was described as being operated by Macleod’s Ltd, with Mr Tollefson still manager. Now the tires were Crest Deluxe, and Penn Oil had been switched to Supreme Compounded Oil. Western Auto itself was now a division of Gamble-Skogmo Ltd, a retail conglomerate whose Canadian arm was Macleod’s Hardware based in Winnipeg. In 1951 there were new companies in the building. Roneo were selling their office equipment from here, along with three home oil companies; Oil Heat Service, Roswite Oil Heating and York Heat. In 1952 they were briefly joined by the American Automobile Association and the BC Automobile Association. 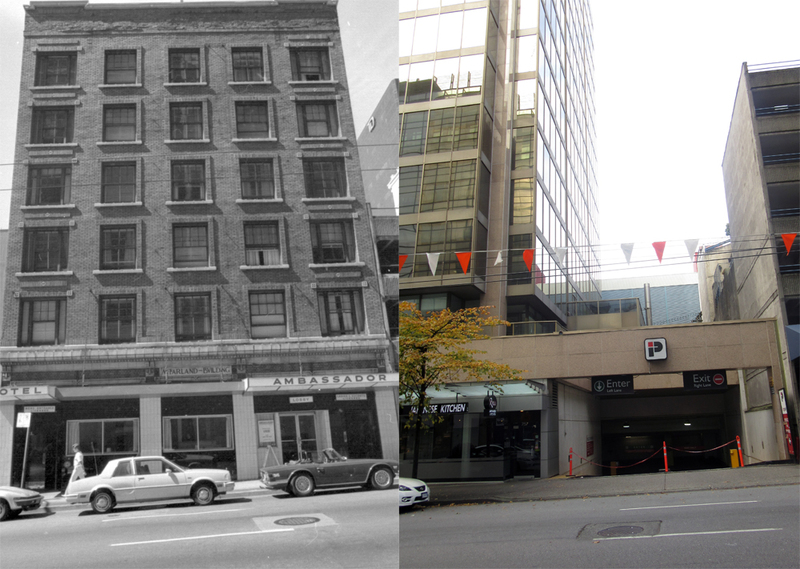 None of the companies lasted here: in 1953 the building was shown as vacant, and in 1954 the address disappears altogether – combined as 520 West Georgia with Vancouver Parking shown as the occupants. That’s because in 1953 a parkade was built here, that lasted until the 2012 replacement with the Telus Garden office building designed by Henriquez Partners for Westbank and Telus. We have no idea who designed the 1938 building; or for that matter the 1953 parkade. The new Telus Garden office is an unusual building for the city because it’s over 250 feet wide, at the end of a block. That’s because the lane dog-legs into Richards, but this wasn’t always the case – it’s a newly created diversion. The first building on the site was built in 1889 and designed by William Blackmore. It was the First Congregational Church, seen here around 1905 – it stood here for only just over 20 years. The First Congregational Church held its first service on April 28, 1888 in Wilson Hall on the southwest corner of Cordova and Abbott streets. The congregation was officially organized on June 17, 1888. It secured property on the corner of Richards and Georgia streets, with the new church officially opening on December 8, 1889. The congregation split away to form Central Congregational Church over the issue of pacifism, but returned to First Congregational Church in 1903. It sat across the street from St Andrew’s Presbyterian, built only a year later and also designed by William Blackmore, (and from the look of the two buildings he was a keen recycler). The church authorities bought property at the corner of Thurlow and Pendrell Streets and a new church was opened on November 9, 1912. In 1925, First Congregational Church became part of the United Church of Canada and First Congregational was amalgamated with St. John’s United Church. The 1912 First Congregational Church building was given to the continuing Presbyterian Church. In the meantime this site had already been cleared, although it previous use seems to have been influential enough that despite barely surviving 20 years, the lane between Seymour and Richards was for a while called Church Street (one of very few named lanes in the city). It looks as if the site stayed empty for several years – there’s nothing shown in the street directories for this location for several years until “Brandon Auto Livery” is listed just after the end of World War One. 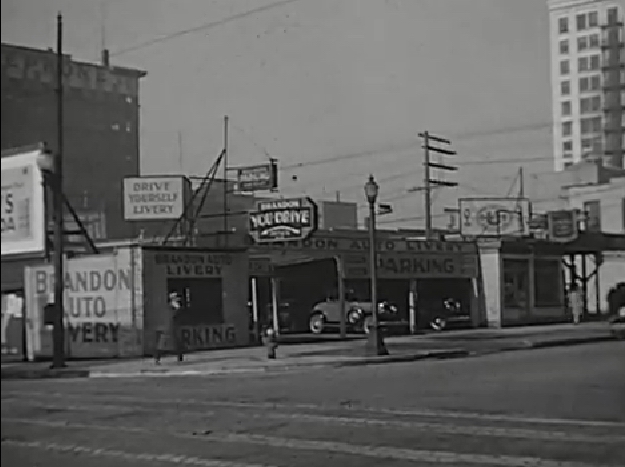 That was also a gas station – we don’t have much of an image of it: just a 1930 movie in the Vancouver Archives. It was operated by Home Oil, and it stood here until the mid 1930s, sharing the location later in its existence with ‘U-Drive Ltd’ – one of the earliest car rentals in the city. In the early years of the operation the company was owned by R G Hetherington. In the early 1920s it passed to G A Mathers and C J Hamilton, who was replaced by J H Mills at the end of the 1920s. As far as we can tell the final year of operation was 1937, when it was being run by L Richardson.